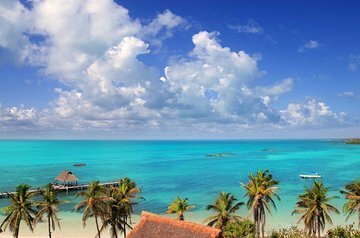 Kombinera besök på Contoy Island, en fågelbadning; och Isla Mujeres på denna heltidsturné till Mexikanska Karibien från Playa del Carmen. Resa till Contoy Island via snabbbåt, sedan snorkla ta en ekologisk tur på ön, och välj från några ytterligare aktiviteter före lunch. Gå till Isla Mujeres för fritid på stranden och utforska staden. Lunch, snacks och obegränsad dryck tillhandahålls. This was an amazing tour. You start with the snorkeling activity, then go to Isla Contoy Parque Nacional, and finish at Isla Mujeres. A delicious lunch is included -best meal I had during my vacation (the fish was delicious). What was even better was our amazing tour guide (Stefi). She was so knowledgeable and easy to approach. She gave us a lot of interesting information about every stop. My cousin got sea sick and she was so attentive and caring. Would love to go back on this tour, to learn more from her. Gorgeous!! Absolutely gorgeous islands to visit. Catamaran was a blast! Could not have asked for a better crew. I got sea sick on the way back and the guide was very quick to tend to my needs. Endless amounts of beer, tequila, water, and soda! Highly recommend you give this tour a try! What an awesome way to spend the day! The island is simply gorgeous! Enjoy!